Story - Legal Claims Assignee I, LLC. Conoco enjoyed an advantage over its competition -- Nicandros had a very good friend, President George H. W. Bush, who also had a long history of making deals with rogue states, including Iran. In fact, Bush had been twice exposed for coordinating illegal dealings with Iran -- Ronald Reagan's 1979 October Surprise, and in the “Iran” prong of the Reagan-Bush administration's Iran-Contra Affair. To help Nicandros, Bush promised Nicandros to intentionally fail in his responsibilities to enforce US sanctions law against Conoco. Nicandros planned to trade US technology and financial assistance for a share of Iran's Serri A and E fields, just a few miles from Conoco's Fateh production facilities offshore United Arab Emirates. With Bush's promise that no enforcement action would be taken against Conoco, Nicandros planned to meet with officials of Iran's state owned oil company in Dubai on September 11 and 12, 1991, to discuss Nicandros' proposal to assist Iran in the development of the Sirri fields. 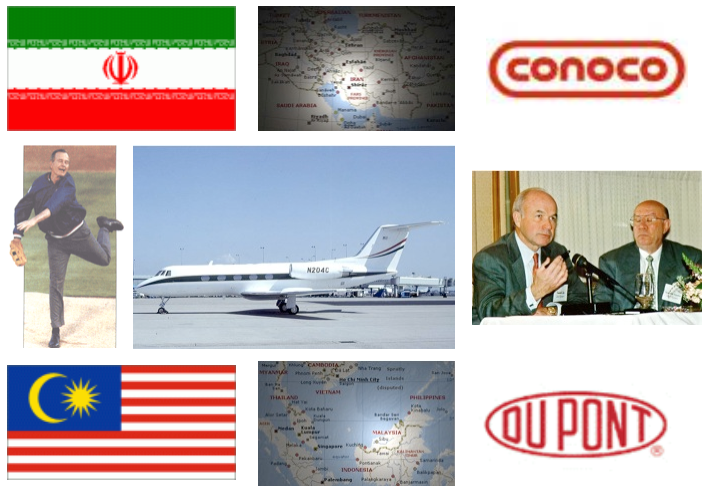 To keep the deal from being a flagrant violation of US sanctions law, Nicandros planned to use a Dutch front-company, Conoco Iran, B.V., itself a subsidiary of a DuPont subsidiary (a Conoco “affiliate”), DuPont Services, B.V. (DPS). Through a widely abused provision in Dutch tax law, DuPont enjoyed a lucrative tax benefit by passing money it earned from its European operations through oil and gas projects managed by purportedly “independent” DPS officers in the Netherlands. The “independent” facade was maintained for the benefit of Dutch tax authorities and had no substantive effect on Nicandros' absolute control over DPS activities, in fact DPS Managing Director, David Solberg, was not even advised about the negotiations that Nicandros planned to have with the Iranians in September 1991. Born in Port Said, Egypt, of Greek parents in 1933, Nicandros obtained a law degree from Ecole Des Hautes Etudes Commericales, in Paris and an M.B.A. degree from Harvard (1960). Despite more than thirty years in the oil business, Nicandros had little technical knowledge about the oil and gas business, so in his negotiations with the Iranians, Nicandros needed to have a Conoco executive who could speak intelligently with the Iranians about the technical aspects of Conoco's development plan for the Sirri A and E fields. Nicandros chose one of five Executive Vice Presidents who reported to him, William K. Dietrich. Dietrich was educated as a petroleum engineer and had served years before as Managing Director for the Conoco subsidiary, Dubai Petroleum Company, which owned and operated the Fateh production facilities. Until September 4, 1991, Nicandros' plan was on schedule for the closing negotiations in Dubai, then at 2:15 p.m. local time (1:15 a.m. Houston time) a DuPont Gulfstream II jet carrying Dietrich crashed into the side of a mountain in the Malaysian state of Sabah on the Island of Borneo. Dietrich was on the Tokyo-Jakarta leg of an around-the-world trip that would put him in Dubai on September 10th. On the same plane were Conoco Executive Vice Presidents Colin Lee and Kent Bowden, their wives Brooke and Connie; Conoco Managers Jim Myers and Ann Parsons, and Myers' wife Linda; and Steward Steve James, Copilot Gary Johnston; and Pilot-In-Command Captain Kenneth R. Fox. Dietrich was carrying notes and documents for the meeting with the Iranians that implicated the Bush administration with knowledge of Nicandros' plan. Now Dietrich's body, his documents and the bodies of the other eleven people on board the aircraft were strewn through a montane forest, 30 nautical miles from the airport at which the plane's pilot, Captain Fox, was scheduled to land for refueling. Within two hours, Nicandros learned that Dietrich's plane was missing and had probably crashed. He immediately understood that he and Bush had a big problem if Dietrich's documents fell into the wrong hands. However, the documents were more damaging to Bush than they were to Conoco , because they would reveal Bush's knowledge of the Iran-Conoco deal and reveal Bush's intent to subvert rather than enforce the sanction laws of the United States. Bush's past dealings with Iran would likely to be an issue in the 1992 political campaign against him; Bush could not afford more revelations of his direct involvement in giving Nicandros an illegal business advantage in Iran. It would have been difficult for Bush to claim that he “...was out-of-the-loop.” Nicandros understood Bush's situation and he knew that Bush would be eager to lend Nicandros the assistance of any government agency under Bush's control to recover Dietrich's documents. Within twenty-four hours of the crash and more than twenty-four hours before the location of the crash site was disclosed to the public, Nicandros and his lawyers learned that much more damaging evidence than Dietrich's documents was strewn in the forest floor at the crash site. While reviewing Conoco medical files of the Conoco and DuPont employees on the plane Conoco General Counsel, Howard J. Rudge , learned that their physicians had had incontrovertible medical evidence since August that Captain Fox suffered from alcoholism. Fox's last medical exam by Conoco physicians in August, less than a month before the crash, showed that Fox's liver was damaged to a degree that even the 1991 Federal Aviation Regulations defining “alcoholism” mandated Fox's grounding. As Nicandros considered his situation he was well aware of the recent scandal caused by the public disclosure of Exxon Valdez Captain Hazelwood's Exxon-enabled alcoholism. Nicandros knew that his career in the oil industry would be over if any evidence of Fox's alcoholism became known. Under the ruse that he needed help from several US Federal agencies to recover the incriminating documents from the crash site, Nicandros used the assigned Federal agency employees to assist in carrying out a second, parallel cover-up. Nicandros wanted all evidence destroyed that indicated Fox was drunk when he crashed the plane. Nicandros wanted (1) all incriminating medical records on Fox in Conoco's and DuPont's medical files destroyed, (2) the plane's original cockpit voice recorder (CVR) recording destroyed and (3) all remains belonging to Captain Fox destroyed. Nicandros assigned Rudge to handle the details of purging the evidence from Conoco's and DuPont's files that could cast any doubt on Fox's sobriety while flying or that showed Conoco's and DuPont's knowledge of Fox's alcoholism. However, getting the evidence at the crash site in Malaysia was a more difficult task and would probably require sending a high-level company representative to Malaysia to take charge of the many Federal agency employees Bush would deploy to assist Conoco. Soon after learning of the missing plane on the morning of September 4th, Nicandros directed DuPont Director of Aviation Frank E. Petersen, Jr. (Lt. Gen. USMC, Ret.) , who was based at the DuPont's hanger at the New Castle County Airport near Wilmington, Delaware, to immediately put together a team of “investigators” from his staff to go to Malaysia. Nicandros told Petersen to fly to Houston that day to get final, detailed instructions. After receiving Nicandros' instructions in Houston, Petersen and his ten-man “investigation” team departed Houston for Malaysia late morning of September 5th flying in a DuPont Gulfstream IV. They arrived at Kota Kinabalu on September 6th at about 11:00 p.m. local time. Although Malaysian police reports indicate that the crash site was located by the late afternoon of September 4th, the search and recovery (SAR) efforts went into slow motion after representatives from the US Embassy in Kuala Lumpur arrived in Kota Kinabalu to “coordinate” the SAR operations. It appears that SAR operations were purposefully stalled to give Bush and Nicandros time to position their people in Malaysia to oversee the recovery work. The crash site was only officially “discovered” at noon on September 6th. A six-man team of Malaysian Special Forces was lowered by helicopter into the forest that afternoon. When Petersen's team arrived on September 6th, Conoco and DuPont had already had more than twenty other employees and contractors deployed to Malaysia from Indonesia and Singapore. The first to arrive in Kota Kinabalu, early on the morning of September 5th (the evening of September 4th Houston time), were a Conoco lawyer from Jakarta, a DuPont public relations manager from Singapore and an contract physician with Asia Emergency Assistance, Inc. from Singapore. Later in the week Conoco also deployed a heavy-lift helicopter and crew from Conoco's Indonesian operations. The helicopter was to be used to recover the victims' remains when they were located. Sabah state and Malaysian federal governments provided more than sixty police and military personnel, and three heavy-lift helicopters to transport personnel and remains. Malaysia's Department of Civil Aviation (DCA) sent only one investigator to the crash site to conduct a field investigation. Apparently, seeing the massive contingent of US investigators, the DCA believed that the Federal agencies would conduct a thorough investigation. When he arrived at the SAR command center at Keningau on the morning of September 7th, Petersen took command of the Malaysian military personnel who were charged with securing the crash site and extracting the victims' remains. Rather than taking the remains out by helicopter long-line techniques commonly used in the oil field and logging operations in this part of the world, Petersen ordered the Malaysians to build a helicopter landing pad near the crash site before anything was airlifted from the site -- a task that would require a least two days of arduous work by the team at the site. Petersen was obviously stalling for time so that his Federal agency assistants had time to get to Malaysia and help him with his tasks. Considering that no report about the “investigation” of this private plane crash has ever been issued, the number of Federal agencies involved and the number of Federal employees sent to work on the SAR and the “investigation” was unprecedented: Six Consular Officers from the Department of State (DOS) and/or Central Intelligence Agency (CIA); one investigator from the National Transportation Safety Board (NTSB); two investigators from the Federal Aviation Administration (FAA); twelve investigators from the Office of Armed Forces Medical Examiner (OAFME) , and one investigator from the Federal Bureau of Investigation (FBI). By September 9th the Malaysians had completed the helicopter landing pad and one of the two DOS/CIA men brought in from Manila was sent to the crash site to oversee the work being done by the Malaysians. Videotape shot of the crash scene by a DCA employee shows the DOS/CIA man making an inventory of the “things” that the Malaysian military personnel working at the scene are bringing him. The man appears to have no interest in noting or recovering the victims remains some of which can be seen hanging in trees just a few yards away from where he stands. The videotape makes it clear what the most urgent mission of the Federal agency personnel deployed to the crash site was and who was really directing the SAR work. The plane's CVR was found on September 9th, and on September 10th Criminal Investigations Division (CID) personnel with the Sabah state police had completed their legal responsibilities in locating, bagging and labeling the remains of the victims. The CID team documented their recovery work by mapping the location of the remains and by taking photographs and videotape of their work. On September 10th, while Petersen was in charge, two body-bags were removed from the crash site, taken to Kota Kinabalu's Queen Elisabeth Hospital, and custody for the remains was officially turned over to DOS Consular Officer Peter Kaestner by 9:00 a.m. Kaestner and a Conoco physician took the remains to a room in the morgue for inspection. Rudge had gotten the victims' families to execute an authorization for Conoco to take custody of all the victims' remains. The authorizations were sent to Conoco Counsel Walter L. Brignon who had been sent to Kota Kinabalu from Jakarta to oversee the “legal” aspects of the search and recovery. Brignon presented the authorizations to Kaestner, who had had the responsibility for taking custody of the US citizens' remains from the Malaysians; then Conoco took legal custody of the remains. On September 11th Petersen abruptly left Malaysia in the Gulfstream IV. Petersen left instructions that no other remains were to be removed from the crash site until the OAFME team he had called to Malaysia arrived. The OAFME team did not arrive until September 14th. On September 15th, after lying bagged in the forest for more than a week and a half, the remaining bodies were finally flown from the crash site to Queen Elisabeth Hospital. To divert attention from the theft of Fox's remains, Petersen asked the prestigious OAFME to identify all the remains found by the Malaysian CID. In fact, the remains Petersen allowed the OAFME access to were only the remains from which Petersen and/or his lieutenants had culled Fox's body before the OAFME arrived in Kota Kinabalu. In his 1992, deposition testimony in the wrongful death cases, Petersen would falsely testify that: “...sadly, no pilots' remains were recovered...”; thus “...sadly...” no toxicological tests were performed. To complete the work Nicandros assigned him, Petersen had to get the original CVR recording, which contained recordings of Fox's voice that may have had powerful evidence that Fox was flying while intoxicated. In the custody of the Malaysian DCA, the CVR was taken from the crash site on September 10th and taken by a DCA investigator to the United Kingdom Air Accidents Investigation Branch (AAIB) to be decoded and copied to audio cassette tape. After the AAIB decoded and copied the part of the CVR recording that the DCA had requested, the investigator brought the original CVR recording and the partial copy back to DCA headquarters in Kuala Lumpur. On September 16th the NTSB investigator, Robert P. Benzon, and the two FAA investigators sent to Malaysia on Bush's orders, representing themselves as acting on behalf of their respective US Federal agencies, met with DCA officials in Kuala Lumpur and demanded that they be allowed to take possession of the original CVR recording. Upon this purportedly official request of the world-renowned NTSB and FAA, the DCA officials turned the original CVR recording over to Benzon. When Benzon arrived back in the United States on September 18th, he immediately took the original CVR recording to Petersen in Wilmington. Benzon would later testify that he had also obtained a copy of the partial CVR recording made by the AAIB, but he “threw it in his waste basket” when he learned that wrongful death lawsuits had been filed. In the end, the DOS/CIA men that Bush sent to Malaysia recovered Dietrich's documents keeping Bush's involvement in the Iran-Conoco deal quite. And, Nicandros, Rudge and Petersen successfully concealed and destroyed evidence that they knew would reveal the cause of the plane crash that killed twelve people they called “friends”. An Executive Vice President of E. I. du Pont de Nemours and Company (DuPont), Nicandros was installed by DuPont as Conoco President and CEO in 1987. Since 1997, Nicandros' successor, Archie W. Dunham, and Halliburton President and CEO, Richard B. Chaney have been in the forefront of oil industry public relations efforts to soften Congressional and public opinion towards Iran. Rudge was also DuPont Assistant General Counsel. The same morning Nicandros promoted Petersen from “Director” to “Vice President”, an unprecedented three-level jump in corporate position to a status of a corporate” officer”. Nicandros' motivation was obviously to give Petersen the legal authority and status he needed to do the dirty work Nicandros wanted Petersen to do. Also, as a Vice President, Petersen would be the sacrificial corporate officer to fall on his sword (as good Marine) if it became necessary to shield Nicandros. Documents obtained in Malaysia reveal that Conoco or Conoco's insurer, American International Group (AIG) paid more than $250,000 to the local police for their work. The AFIP team had recommend that Conoco bring all of the remains to a US facility (Okinawa, Hawaii, Maryland) where identifications could be made conveniently by AFIP personnel using their own equipment. However, Conoco insisted that the AFIP team go to Malaysia and agreed to pay more than $300,000 to for them to do so. Similar evidence was used by the NTSB in establishing Exxon Valdez Captain Hazelwood's intoxication on March 24, 1989. Conoco lawyers were following this case very closely. Roger K. Parsons holds a Ph.D in theoretical physics obtained under the direction of Nobel laureate physicist P. A. M. Dirac. In 1980, before DuPont acquired Conoco, Parsons joined Conoco to do research on algorithms to image subsurface mechanical properties using seismic acoustic data -- the miles-scale version of ultrasound medical imaging. Parsons eventually supervised DuPont-Conoco research and development efforts in Ground Penetrating Radar (GPR) technologies for use at DuPont's mineral mining operations and at DuPont and Conoco groundwater and soil contamination sites. In 1986, Parsons was named group leader of Conoco's Theoretical Geophysics Group. Parsons is author of several professional papers, internal research reports, and patents. In 1989, Parsons moved into executive staff positions. First, as Executive Assistant to DuPont Vice President and Conoco Executive Vice President for Worldwide Exploration, Dr. Max G. Pitcher. Parsons' last position at Conoco was Exploration Coordinator -- Scandinavia, East Africa, Middle East and Libya. In January 1992, Parsons was fired from Conoco after asking Conoco and DuPont executive management to investigate why two unprepared, inappropriately trained, and probably unhealthy pilots were sent on an extensive overseas trip. Ann Parsons, Roger Parsons' wife and a manager with Conoco, was one of the twelve people killed in the DuPont plane crash in Malaysia. Since 1991, Parsons has devoted his efforts to the investigation and analysis of the causes for the DuPont plane crash in Malaysia, including spending seven days at the crash site surveying the debris field. Parsons has written a detailed report (DuPont G-II N204C Crash) on his analysis of the ground track for the DuPont aircraft during the time captured on CVR and ATC voice recorders. Parsons continues to petition authorities with the UN-ICAO, the US FAA and NTSB, the Malaysian DCA and Attorney General, and the DuPont and ConocoPhillips Board of Directors to conduct a thorough investigation and issue a report on the circumstances of and causes for the DuPont-Conoco aircraft crash.